In the year 1915 the Great War reached the, at the time, Austrian Dolomites as the neutral Italy declared war to the Austrian-Hungarian Empire. The military high commando feared that bypassing the Alps the Italian army could reach the city of Vienna in just one week, so it was decided to secure the most important routes and mountain passes at the national borders. 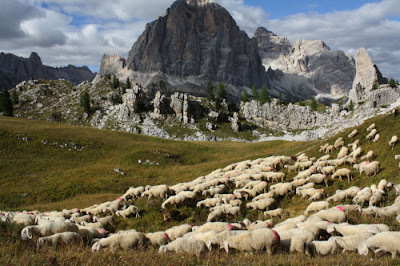 The Falzarego pass, connecting the city of Cortina d´Ampezzo with the western valleys, was of strategic significance - this pass is situated at 2.105m a.s.l. and is dominated in the north by the nearly vertical cliff of the small Lagazuoi, a 2.700m high mountain. Fig.1. 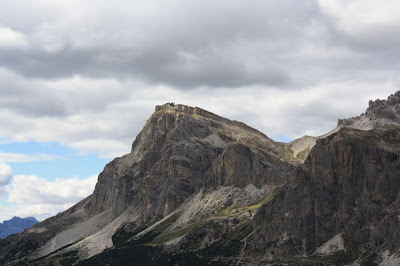 The Lagazuoi overlooking the Falzarego pass situated at the left corner of the photography. The Austrian front line followed the crest of the mountain. 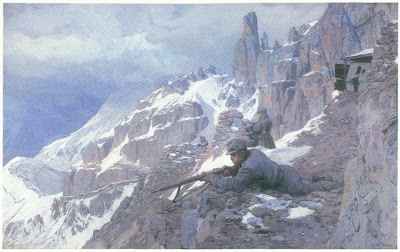 There was no experience with war in such an extreme and alpine environment, it was nearly impossible to attack directly the enemy when he hid behind inaccessible rocks or in steep cliffs and soon a position warfare between the Austrian and Italian troops developed. The strategists of the military tried to resolve this problem with a war technology successfully adopted in the soft shale, cretaceous sediments and quaternary deposits of the low plains of France, Netherlands or Russia: the mine war. Long tunnels were dig until approaching hidden in the underground the enemy front line, then the end of the tunnel is filled with explosives or mines and the enemy simply blasted away. In mountains by undermining the enemy position or by causing rock-fall on the enemy it was possible to misuse the geology as tactical weapon of mass destruction. However the Triassic rocks of the Dolomites were much harder to excavate than expected and only with great effort in material and men it was possible to extend the military tunnels by 10m every day in the dolostone. In the years 1915 to 1917, when the war in the Dolomites was finally abandoned, at the entire front line of Tyrol 34 blasting operations were attempted, 20 by the Italian army and the remaining by the Austrian army. The Austrian army realized the importance to know the geology of the battle fiels and instituted a special division formed by war-geologists - the "Kriegsgeologen". These geologists recorded the geology in the front line and studied the best solutions for engineering problems to construct defensive positions, artificial tunnels and other military infrastructures. Apart their military duties they however enjoyed great liberties and were allowed to move free at the front line and to continue their scientific work by collecting samples, rocks and fossils. Also in the Italian army many professional geologists were engaged, even if the Italians never possessed an own military geologists-division. Fig.2. A romantic view of the war in the Dolomites as seen by the Austrian artist and alpinist Gustav Jahn (1879-1919), who fought in the first world war. Soon the soldiers realized that this war would last much longer than expected and that the beautiful landscape hid a harsh mountain environment that would cost more lifes than the battle operations. The Lagazuoi is composed of the Cassian Dolomite-formation, dolostone of a former Triassic reef complex with the massif reef core at its centre and the clinostratification of reef debris interfingering with marls of a sea basin to the east. The dolostone of this formation is hard but brittle and also tectonically weakened, so driving small tunnels into the mountain is still possible, even if a tedious quest. In 1915, to reach the Italian position situated in middle of the southern rock wall of the Lagazuoi, the Austrian army begun to excavate from the northern slope a tunnel trough the mountain. Adopting a similar strategy the Italian soldiers tried to undermine the peak of the Lagazuoi, where the Austrian soldiers were stationed, so the Italian excavated in five months a more than 1.000m long tunnel to reach a position below the mountain peak. "In the tunnels I'm afraid to be blasted into the air from below or to become entrapped, the pointers of my clock seem to slow down in this place, a second lasts for two, a minute for 20 minutes, a night can last forever and it seems that the sun is gone forever." Fig.3. The Austrian front line follows a rock wall on the summit of the Lagazoui - today the huts and the tunnels used by the soldiers are a memorial place. Fig.4. A simple hut constructed by the soldiers. Fig.5. 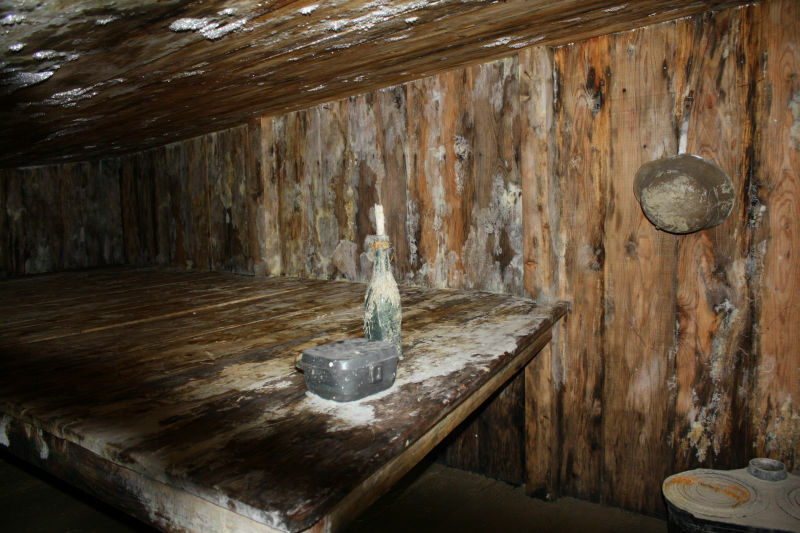 Inside the hut, the soldiers lived for months, often the entire winter, in such primitive shelters. Fig.6. View outside one of the tunnels through a loophole into the valley. 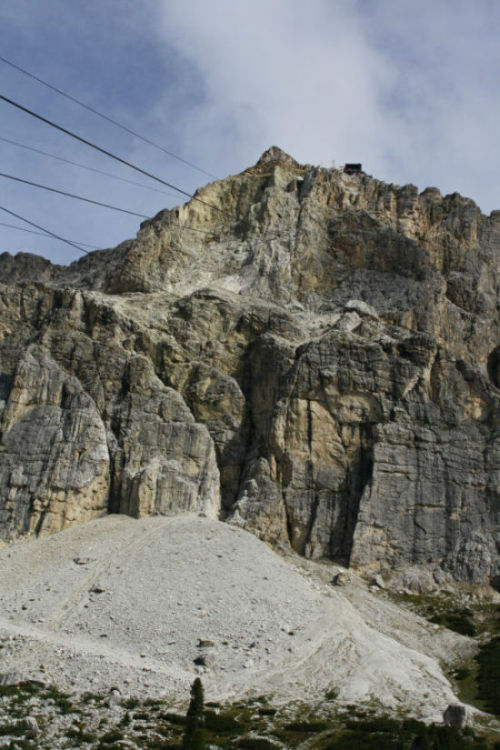 Shortly after midnight of the new-year day of 1916 the Austrian army initiated the mine wars at the Dolomites front with the detonation of 300kg of explosives inside of the Lagazoui. A large boulder was blasted off but it caused only minor damage on the huts of the Italian position. 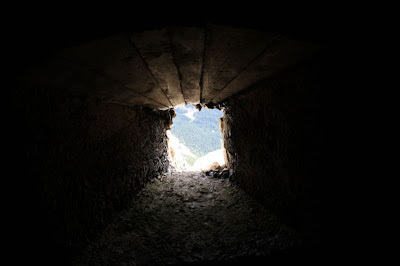 On 11.07.1916 the Italian army blasts off the "Castelletto", a rock ledge on the steep cliff of the Tofana di Roces, a mountain situated in the east to the Lagazuoi, using 35.000kg of explosives hidden in a 400m long gallery inside the mountain. They hope to bury and destroy the underlying Austrian front line, 13 soldiers were killed. Fig.7. The Tofane di Roces today. On 14.01.1917 using 16.000kg of explosives a 37m in diameter and 45 deep crater was blasted into the mountain, still today the debris of the explosion is recognizable at the base of the cliff of the Lagazuoi (left debris cone). 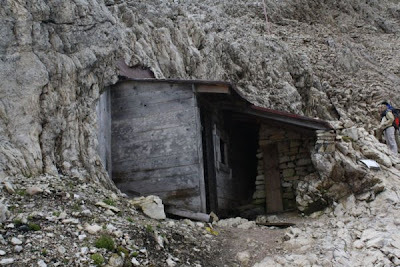 22.05.1917 the third Austrian blast operation with 30.400kg explosives tries to destroy the Italian position, 200.000 cubic meters debris fell off from the mountain producing a 200 high and 140m broad scar, 4 Italian soldiers were killed. 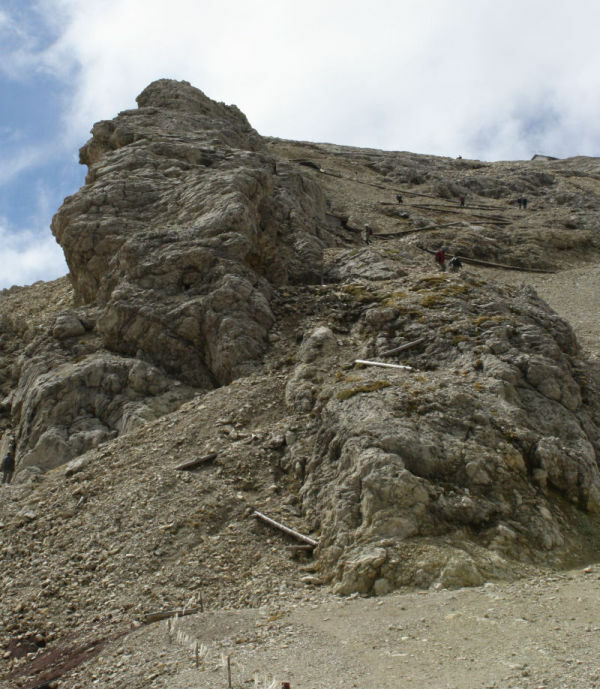 In the morning of the 20, June 1917, after the construction of a complex gallery trough the mountain, 33.000kg of explosives deposited under the peak of the Lagazuoi explode, tearing apart the mountain and producing the right debris cone at the base of the Lagazuoi. Fig.8. The scar in the rock wall and the debris cone produced from the explosion in 1917 is still well visible. The Italian front line was situated in the middle of the rock wall, on the large step visible in the photography, formed by the contact of two stages of the reef-growth during the Triassic. "I realize that in few moments the results of all this months, in which we worked and suffered, will be shown. I'm like petrified. In this last moments my thoughts are by the enemy - poor guys - do they feel that death is approaching, do they anticipate that their enemy is inside the mountain and will hurl them from the summit of the mountain into the grave ?" In the end the various attempts and operations in all these years didn't change the front line or the progress of the war - and still today the scars of the mountain are visible like silent reminders of the madness of war. I find the concept of Kriegsgeologen totally mind boggling and so wonderfully Germanic. Pretty pathetic actually. The idea that explosives could fracture and move enough rock to make the effort worthwhile - they just did not understand much geology back then I guess. It takes kiloton yield nuclear weapons to have that kind of effect. Considering that a single small rock can already kill you and rock fall and avalanches caused most deaths during the war this was an “appropriate” strategy was. Quite with common explosives you can achieve the needed results and – as unfortunate war is – engineering geology experienced a major impulse by the war. There were however experiments with nuclear bombs in the 60/70 to use them for excavation and engineering, the results were however unsatisfying.